Emergency services are order of the day and that too for a district like Kanyakumari that receives visitors from all over the world throughout the year. As a matter of fact, effective handling of emergency situations is a must for any city. Emergency situations may strike out of the blue and may create massive tragedies and immediate handling of such situations will probably reduce the impact most of the times. Emergency situations may occur in any form, road accident, burglary, fire accident or emergency medical needs, the situation can well be handled by professional people like fire fighters, police force, blood banks, ambulance services and hospital services. Kanyakumari district houses a lot of government and private players who primarily work to create a safe living environment for the people of Kanyakumari. 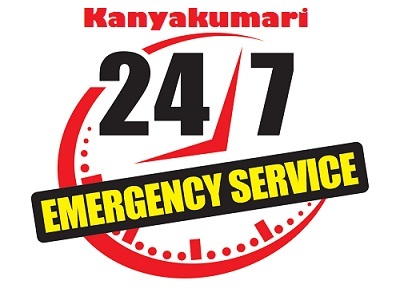 It has to be mentioned that Kanyakumari district has emergency services of the highest quality. Kanyakumari was one of the worst hit districts in India by the deadliest tsunami (tidal wave) that devastated the seacoasts of several nations in South and South East Asia, on the fateful day of 26th of December 2004. The wide range of emergency services of Kanyakumari district played a crucial role in saving hundreds of thousands of people and bringing back the region to its normality. The administrative structure of the police department in Kanyakumari district is separated into four exclusive subdivisions that are headed by an Assistant Superintendent of Police or Deputy Superintendent of Police. Police stations are the primary units of police department's governance in the territorial dominion of Kanyakumari. As per the Code of Criminal Procedure, every law breaking activity has to be entered in the police records at the respective police station and all cautionary, investigatory and law and order process is executed from police stations. Furthermore, police stations in Kanyakumari district are divided into a various beats (beat is the territory and clock time that a policeman patrols), that are allotted to police constables for policing, surveillance, collection of intelligence information and so on. Fire and rescue service in Kanyakumari district is regarded as one of the most efficient emergency services in the district. The district's fire and rescue services play an all-important role in fire fighting and fire prevention in the district. Find below the list of fire stations in Kanyakumari along with their contact details.